This at least appears to be the dawning of a new era for the Lions, so it’s too early to know what options actually will be on the table for the team’s new GM. It is clear, though, that trading or releasing Stafford should not be one of them. It should be obvious to the decreasing number of increasingly intoxicated people who watch or listen to Lions games on a regular basis that Stafford is not the source of the team’s problems, and his track record repeatedly has proven that he can be one of the team’s greatest assets. Moreover, it’s impossible to evaluate Stafford’s performance without accounting for the fact that he’s playing behind an offensive line that has ranked overall worst in the NFL, and worst in pass blocking in particular. With insufficient run blocking to allow the running game take the pressure off the passing game, and no protection against that pass rush, it’s difficult to imagine any quarterback succeeding in Stafford’s shoes. Identifying Stafford as a significant problem here simply identifies you as a poor identifier of significant problems. Related, identifying the Lions’ best chance of future success as a strategy involving replacing Stafford with a top draft pick identifies you as a poor identifier of successful NFL strategies. As many have marveled at the enduring successes of Tom Brady and Peyton Manning, people have realized how difficult it is for younger quarterbacks to succeed in the NFL. Detroit already has that exceedingly rare commodity: a fairly successful (in spite of contextual challenges) quarterback whose play provides a reasonable basis to believe that, surrounded by better supporting pieces, he could be even better. Assuming that a rookie quarterback would do better than Stafford under the same conditions makes no sense (no sense!). The next Robert Griffin might have both legs literally torn off at his knees if he played for the Lions. The next Andrew Luck might grow a neckbeard because he hopes it might help him hide from defensive linemen. Would anyone consider Sam Bradford or Ryan Tannehill improvements over Stafford? Of course not. There’s little reason to expect the next crop of QB draftees to be significantly different from their recently drafted counterparts. There’s a slight trend indicating that older quarterbacks are better than younger ones. There are some obvious explanations for this. An older guy wouldn’t continue to receive NFL job offers if he was not performing well. He’d also have more experience, which, one would presume, allows him to play better than a less-experienced, younger QB. It generally is understood that athletic performance follows a fairly uniform pattern, rising in youth, peaking at some point, and then declining thereafter. The timing of that peak relative to a player’s age appears to be different in different sports, but there seems to be some internal consistency within a given sport. 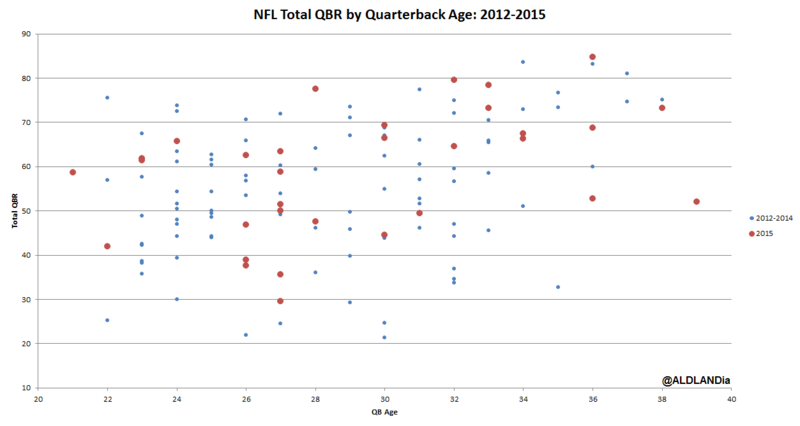 Most quarterbacks are about twenty-one or twenty-two years old when drafted, and the above graph suggests that it takes them a few years in the NFL to develop into good NFL quarterbacks. At a minimum, trading or releasing Stafford and orienting the team around a rookie QB would reset this developmental clock, and there’s absolutely no guarantee that the quarterback the Lions could or do draft will possess an equal or better developmental trajectory as Stafford. Finally, moving on from Stafford at this juncture rightly would be considered rebuilding, and, for Lions fans, the notion of rebuilding where nothing has been built would be extremely difficult to stomach, and watching Stafford enter his quarterbacking prime and succeed in another uniform for another team that provided him sufficient protection and support might be too much to bear. This entry was posted in ALDLAND and tagged dan orlovsky, detroit, detroit free press, espn, ian rapoport, lions, martha ford, matthew stafford, nfl, peyton manning, sb nation, tom brady by AD. Bookmark the permalink. 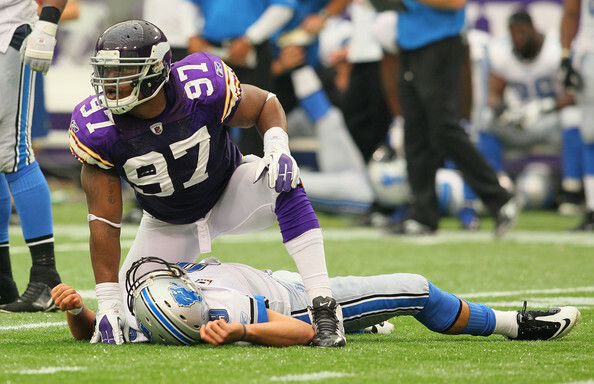 My main thought on Stafford isn’t getting dumped is because there will be no one left in Detroit. Caldwell doesn’t inspire mice and CJ doesn’t seem to be in top form any more. Stafford is the only person in Detroit worth rooting for anymore. Bob Quinn: "I have no interest in trading Matthew [Stafford]"